Diabetics are at a higher risk for gum problems. 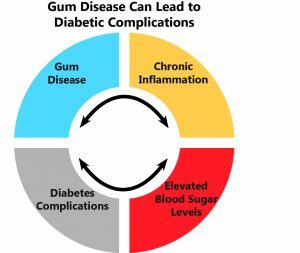 Serious gum disease may have the potential to affect blood glucose control and contribute to the progression of diabetes. When bacteria from your mouth settle into your gums, you have gum disease. Severe gum disease is called periodontitis, At this stage, gums begin to pull away from your teeth. Pockets form between teeth and gums. If nothing is done, the infection destroys the bone around your teeth. This bone loss may cause teeth to move or become loose. Research shows there is an increased prevalence of gum disease among those with diabetes. Diabetics are more susceptible to bacterial infection and have a decreased ability to fight bacteria that invade gums. Poor glucose control makes gum problems more likely. Conversely, gum disease itself may affect glucose control. These risks make it imperative that diabetics take good care of their teeth and gums. Regular professional dental cleanings and check ups are important in maintaining good oral health. Thrush- fungal infection of mouth and tongue caused by antibiotics diabetics take for infections. Fungus thrives on high levels of sugar in the saliva of people with uncontrolled diabetes. Thrush gives mouth and tongue a burning feeling. Some diabetics may need to have professional cleanings more frequently than twice per year. It is important to talk to your dentist and hygienist about what cleaning frequency fits your needs.